Last night, I received the last present from my April 20th birthday. And while it was belated, it was by far the best: a ticket to the Gruesome Twosome tour staring Alice Cooper and Rob Zombie. But you know me, I write about nightlife, so when I found out that Black Bear Saloon and Wet Willies were hosting pre-parties for the concert, well, you know where I ended up before the show. My friends and I had a great time getting our pre-game on at Wet Willies. I finally got to try one of their frozen concoctions  even though I had to order a Weak Willie, and usually, I like my Willies anything but weak. But the drinks were great, and when we caught a glimpse of the arena from the window, we got amped. Although we were ready for a night of the dead, we were surprised to find Wet Willie's practically dead  well, as far as the pre-concert crowd went at least. Based on the suits, black skirts and button-up shirts, I could tell the crowd was mostly the after-work group. The music didnt include any Zombie or Cooper hits, but was a relaxing classic rock mix, featuring songs like "Low Rider." In fact, the pre-party was like your usual night out at the bar, and it created a great atmosphere. In fact, I can see myself going back there after work one night. But we were looking for something a little out of the ordinary since we were going to an extraordinary show. So we headed next door to the Black Bear Saloon. But we ran into the same situation there. There were several groups sitting down for dinner and unwinding at the bar, but none appeared to be Zombies ... I mean, Zombie fans. Wed almost given up on finding our niche until we arrived at the Uptown Amphitheatre. As it turns out, the pre-party wed been looking for was actually going on outside; there were hoards upon hoards of Zombie and Cooper fans, and from all ages, too. From fans that had been following Alice Cooper and Rob Zombie since their beginnings to young adults and children, the concert brought out a mixture of all age groups. 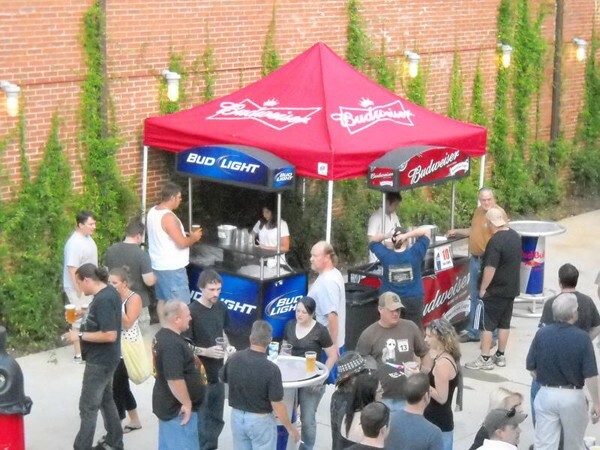 As for the party setup, the amphitheatre had several beer stations and tables set up around the concert space. In fact, it almost reminded me of an Alive After Five setting, but rather for this event, it was more like a "Dead After Five." Concert goers were relaxing on the lawn or standing with friends around the tables. It appeared that even though it was still 30 minutes until the concert actually started, it was only here that the concert goers could find their vibe for a pre-party. On another note, the price of beer scared me to death: $10 for one glass! I was grateful for my $4 Weak Willie. As for the show, it was amazing! But you can read more about from music editor Jeff Hahne. As we were leaving, I noticed a few Black Bear Saloon girls and a gigantic bear promoting their post party. The bear even offered my friend a bear hug, but he wasnt too interested in that. And while the idea of attending a post-party was enticing, we passed. After that concert, we felt pretty dead.